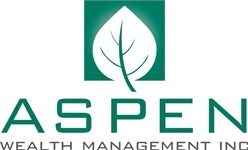 Home | Aspen Wealth Management, Inc.
About Aspen Wealth Management, Inc.
At Aspen Wealth Management, we take great pride in providing our clients with superior service. Our mission is to provide every client with comprehensive, objective financial advice. Expect more than just a business relationship; a genuine personal relationship that takes your circumstances, values and goals into consideration at all times. Your privacy will be carefully guarded, and will not be shared with someone who is not entitled to it. You will be treated with the utmost respect and integrity at all times. Our advisors have the “heart of a teacher” and are committed to explaining financial concepts in plain English; no jargons or complicated industry terminology. We provide ongoing monitoring and regular reviews of your financial plans, accounts, investments, insurance policies, and applicable legal and tax documents. You have the right to continual education delivered by our wealth advisory team during the development and monitoring of your personal wealth plan. Know that any error will be acknowledged and corrected without delay. You will receive independent, objective recommendations based on your defined needs, preferred risk tolerance and financial goals. You have the right to know if you are on track to a successful financial outcome. You will never receive a recommendation that has not been thoroughly investigated in advance. You have the right to know your Risk Number™ and how much risk your portfolio contains. You have the right to receive best execution in all that we do. Portfolio transactions will be executed in a timely manner, with prompt third-party confirmation. All interactions with the Aspen Wealth Management operations team will be timely, precise and prompt. You have the right to accurate third-party reporting of all managed accounts. LPL Financial is the custodian for your accounts, LPL statements will identify all account positions held, cash receipts and disbursements made through Aspen Wealth Management. LPL Financial also provides an online portal where you can view all account information in real time. You have the right to a transparent relationship and to clearly know the costs for portfolio management, transactions and advisory services. Securities offered through LPL Financial, member FINRA & SIPC. Investment Advice offered through GPS Wealth Strategies Group LLC, a Registered Investment Advisor.